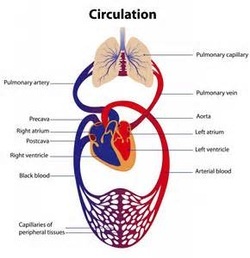 Circulation of blood keeps all human and mammalian alive. This is done with the aid of a major organ called the Heart. Blood contains all the useful and all the waste materials in its composition, and these and transported throughout the body. What is your heart known as? With what two things does your blood supply your body? By the time you are grown up, how many times a minute will your heart have beat? How many different areas is your heart made up of? On your heart, what two chambers on the top fill with blood? On your heart, what two chambers on the bottom fill with blood? What is your heart really good at? How long does it take your heart to pump blood to every cell in your body? Every time your blood circulates, about 20% of it goes through what? The tubes that carry blood away from your heart are called what? The tubes that more gently drain blood back to the heart are called what? What is most of your blood? Why are white blood cells so important? What other cells help your blood repair itself? How many times does your heart beat in one year? The Franklin Institute will help you answer the rest of your questions. The circulatory system has three distinct parts. What are they? Describe each part by clicking on the appropriate link. Have fun being a heart doctor. Go to NOVA and follow the directions to complete the open heart surgery.